Making the healthier route fun. Steps of the staircase are like piano keys and play notes as they are stepped on. One of my Facebook friends found this and shared it. I decided to add it to my blog also. Blog post I put on the Transition Whatcom web site. Transition Whatcom members can post. Everyone can read. That discusses strategies for building new lives and economies as availability of fossil fuels diminish. Many fear food will be in short supply as oil is used in agriculture. I have a different take. Food may not be as impacted as some fear. That's the mantra for many folks seeking a better world. With so much of our manufacturing done in China and salads nicknamed "the thousand mile salad" because of foods coming from far afield, "local" is cherished. A yearning for return to local "farm to market" commerce has been around for years. Gives rise to farmers markets and places advertising food from within 100 miles. Manufacturing is another activity that can come back to local communities and we may have more luck localizing this than we do food. 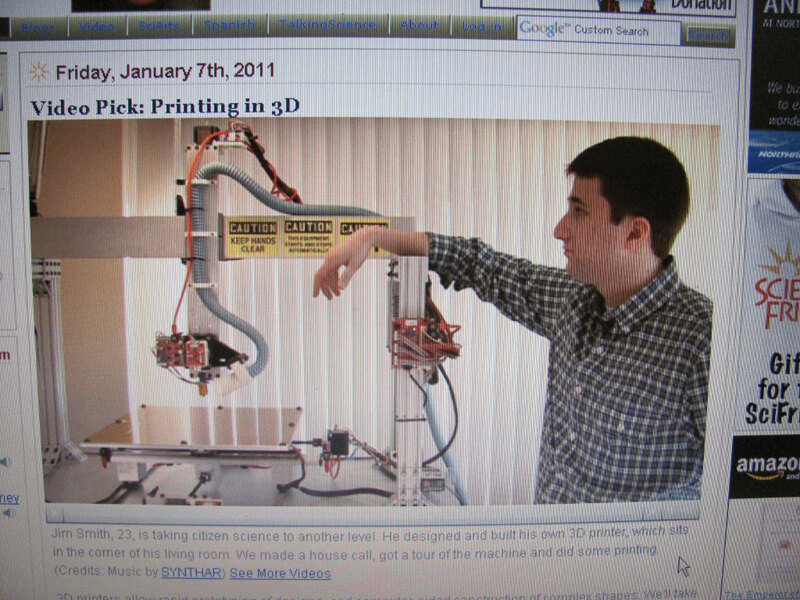 I recently saw this segment of NPR Science Friday on the 3D printer. Interesting little video. 3D printing is getting versatile enough to even make a lot of things in the home shop. I think Alvin Toffler has discussed the term "prosumer." Consumers who can produce a lot of the products they consume. Home gardeners can be called prosumers as well, growing some of what they eat. Re localizing the production of food is an idea that has been around for years, but we may have more luck re localizing other things than food. The problem with agriculture is climate. Most things grow outdoors and stuff like oranges don't grow in places like Washington State. We've become addicted to a very diversified diet and that's not necessarily a bad thing. I'll keep drinking orange juice. Maybe someday, more food will be grown indoors, but the cost of that would be prohibitive for now. Like the convenience of the automobile, it's hard to give up the great diversity of food we now enjoy. I've lived without the automobile, but I'm rare. Most folks wouldn't give up their cars and it seems unlikely their diets either; except maybe going to healthier diets. Fresh lettuce and tomatoes from places like southern California is hard to beat since lettuce doesn't grow here (Washington state) in the winter. The thousand mile salad will be hard to drop, but other things, like manufacturing, may come easier, with new technology. Local food production is great. I enjoy Twin Brooks Dairy (here in Whatcom County), but salad greens from southern California are awful nice this time of year. 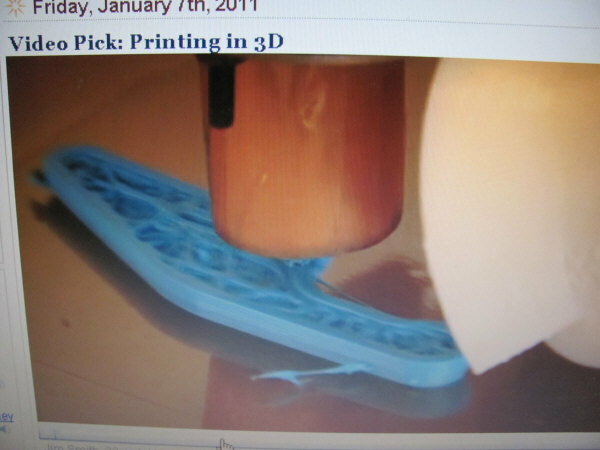 Printing out lots of household items like bottle openers. Unencumbered by the confines of what will grow in this climate is manufacturing. New technologies are coming that can decentralize some of the manufacturing sector. Less products will have to be shipped from places like China. Local people may be closer to the process again. As home manufacturing develops some of the work will be done by hobbyists. By prosumers spending less on being consumers. One reason behind the call to re localize is our depletion of cheap fossil fuel and the related problem of global warming. Shipping food and products worldwide can take energy, but in some cases economies of scale means reduced energy consumption per unit of production. Big farms may not be as bad as some folks fear, while local agriculture can have it's problems as well. Small farming can mean putting more people in rural settings. Often I've thought that it takes less energy to ship an apple across the globe than it does to ship people who live in a small apple orchard to work if they have to work in the city to pay for that apple orchard. For years, people have spoken for the virtues of local food production. The idea has caught on a bit, but propensity to seek vast diversity in diet keeps this from going real far. At the same time, we may see a revolution for the decentralizing of many other services such as manufacturing. Technology is likely to drive this revolution in future years. Other services, such as banking may be "ripe" for a bit of decentralization as well. While there are some advantages to financing on a global scale, we should have learned recently, with the problems caused by loans being sliced, diced and bundled all over the world, that bigger isn't always better. Local bankers will often know local consumers best; doing business face to face. So "buy local" may catch on more and more in the future, but I would guess, unlike what some others might think, it's leading edge will be in other sectors besides food production. Seems like businesses are starting to get busier again and traffic is backing up more. I'm reminded of the gas ceiling that the US economy labors under. As things pick up, oil gets more expensive. Since we import so much oil, it's a tax on the American people. Money sent overseas. Rather than a glass ceiling it's a gas ceiling. Change to a less fossil fuel based economy comes too slow. One piece of good news: Canada benefits as we import a lot of oil from Canada.